As I plan on reviewing some new beauty and make up products, I thought I would start with the most important and basic skin care must haves. I have always been a huge fan of using plain old soap and water on my face, as I dont feel like cleansers give my skin a good enough "clean", but I know most people find soap and water quite harsh, however this works well for me! Botanics by Boots has recently changed their packaging, and released some new products so I thought I would give the Ionic Clay Mask a whirl. It feels quite thin and slippy but it does stay on the face well and doesn't slide off. It is also easy to spread and quite smooth to apply. The instructions say to leave it for ten minutes and then rinse off, but I waited until it had dried. It leaves the skin feeling smooth, and a little bit tight, with my pores reduced in size by quite a lot. 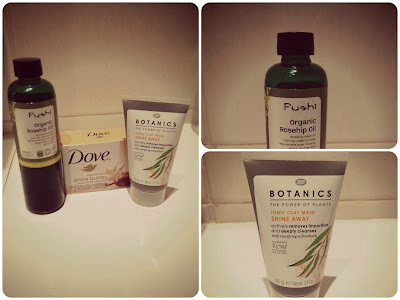 When I have cleansed or used a mask on my face, I use Fushi Rosehip Oil to moisturise. I first read about this just over a year ago in an article interview with the model Miranda Kerr, who is well known for endorsing organic, natural products, and having flawless skin. I wanted to try an alternative to my usual moisturiser and gave this a go. The bottle says it can be used to rejuvenate scar tissue, scars burns and ageing skin, as well as reduce wrinkles, stretch marks and premature ageing, evens tone and smooths roughness of the skin. This is the second bottle I have bought, the first lasted almost 8 months, (I use it every evening) so great value for money as it should be used sparingly. I use a few drops on my palms which I then rub into my face in the evening. It varies from orange to burnt brownish orange colour, and has a unique smell I cant really compare to anything. After using it for almost a year now, I have found it has smoothed and evened the tone of my skin, it looks much more "glowy" and feels soft and smooth. My skin is in much better condition than when I used my regular moisturiser, and I found that I started to use a lot less primer and foundation as my skin didnt need so much make up covering the imperfections! I would highly recommend it, as well as other Fushi products I may do reviews for in the future as they are very reasonably priced and excellent quality. The Rosehip oil sounds lovely...I think I might have to go and pick some up myself to try! thank you for your super nice comment on my blog dear! i appreciate it a lot :) glad you liked it!